Batley Bulldogs boss Matt Diskin. Batley Bulldogs carried their winning run into 2019 with a comfortable 36-0 triumph over Hunslet in the Yorkshire Cup. Matt Diskin's side are now unbeaten in eight outings in all competitions and look well equipped for a successful run in the Championship this season. Diskin has said that he wants his team to be the best part-time side in the Championship, and, based on the evidence against Hunslet, they could go some way to achieving that goal in the upcoming campaign. Hunslet, meanwhile, are aiming to launch an assault on the League One promotion places but looked off the pace in a stuttering display. The Bulldogs did have the chance to brush off the cobwebs in their Boxing Day encounter with Dewsbury Rams while Hunslet haven't played since September 16. Batley enjoyed the early dominance, making good metres in attack while restricting Hunslet's yardage in defence. Half-back Louis Jouffret was instrumental in Batley's victory over Hunslet. Picture: Paul Butterfield. Gary Thornton's side looked to disrupt Batley's flow and forced a few early errors but the Bulldogs - who have recruited shrewdly during the off-season - continued to enjoy the best of the territory. Tempers had threatened to boil over in the early stages and both sides came to blows with just over 10 minutes gone. Both teams were reduced to 12 men with Hunslet's Richard Moore - on his debut for the club - and Batley's Joe Taira shown red cards for fighting by referee Cameroon Worsley. It was the Bulldogs who responded best to going a man down as they scored three tries in quick succession to take control of proceedings. 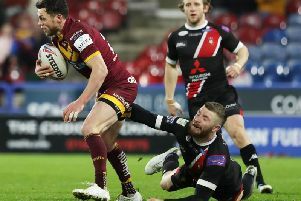 On-loan Huddersfield Giants centre Sam Wood opened Batley's account after running onto Louis Jouffret's pass. James Brown, coming off the interchange bench, then crashed over from close range after latching onto Alistair Leak's short ball. Wood added his second and Batley's third moments later as the Bulldogs continued to make easy metres downfield. Things went from bad to worse for Hunslet when Duane Straugheir was sin-binned for kicking the ball away. Batley made use of the extra man immediately as Keenan Tomlinson offloaded to Jouffret who ran in behind to score. Adam Gledhill extended the lead soon after when he forced his way over underneath the posts. Having lost reliable goal kicker Pat Walker to Sheffield Eagles, full-back Dave Scott was handed the kicking duties and landed three conversions from five attempts in the first half. The second half was a much quieter affair with neither set of defences worked too hard. It took 26 second-half minutes for the first points to arrive as Batley's Paul Brearley shrugged off the tacklers to fight his way over the whitewash. The Bulldogs seventh and final try came moments after when Jouffret fed Tomlinson who slid under the tackler to cross out wide. Batley Bulldogs: Scott, Reittie, Wood, Tomlinson, Campbell, Jouffret, Brambani, Dickinson, Leak, Everett, Manning, Downs, Taira. Subs: Brown, Gledhill, Smeaton, Ward, Brearley, Ogden, Bruce. Hunslet: Watson, Potts, Chappell, Heaton, Bloomfield, Dean, Nicklas, Moore, Wright, Robinson, Flynn, Straugheir, Emmett. Subs: Haley, Hawksworth, Lee, Sanderson, Southernwood, Webb.